An Indonesian army transport plane with more than 100 people aboard has crashed into houses on eastern Java, killing at least 78 people. 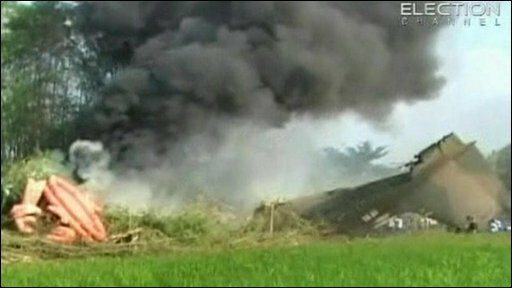 At least two people died on the ground when the Hercules came down near Madiun, hitting houses before skidding into a rice field where it caught fire. Footage from Indonesian television shows chaotic scenes as emergency teams try to tackle to blaze and help those injured.